Innov+ presents Toucango, the driver’s vigilance assistance solution, at AUTOCAR EXPO 2016, a major national event for the promotion of tourism and mobility in coach. The 5th edition of this event takes place at Eurexpo Parc des Expositions in Lyon from 12th to 15th of October 2016. Innov+ has presented Toucango at the occasion of the FNTR on the 4-5th November 2015 in Paris, as well as at the ATEC ITS Congress on the 26-27th January 2016 in Montrouge. At the SITL 2016, the transport professionals will be able to discover and try the Toucango Pro device on a driving simulator on Innov+ stand. Innov+ will exhibit at the Las Vegas CES (Consumer Electronics Show) show from 6th to the 9th of January 2016, in the French Tech Pavillion. 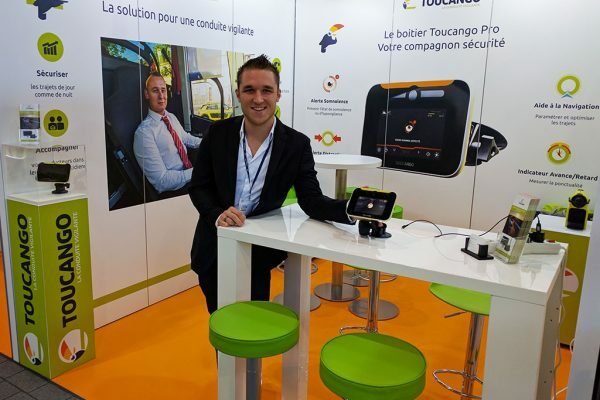 Innov+ was selected by the cluster Mov’eo and Business France among 130 start-ups to present Toucango, its innovative driver’s vigilance assistance system. Installed on the vehicle dashboard, the Toucango Pro device is the most faithful companion of the professional drivers. Thanks to its patented facetracking technology, the Toucango system evaluates the driver’s vigilance and care at the wheel. When signs of tiredness or distraction are detected, an alert is sent in real time to the driver. Toucango is a driver's vigilance assistance solution. It is aimed at reducing the number of accidents due to drowsiness and distraction at the wheel. Toucango has been launched by Innov+, a French start-up that designs innovative face-tracking technologies at man's service. © 2016 All rights reserved. TOUCANGO is a trademark of Innov Plus.